Hi there all at WWM, love your informative site and snappy responses! I've been running a well-planted 20ga for the last year or so, with a dozen zebra/longfin Danios in there. All is pretty okay in terms of water parameters (ammonia, nitrate, nitrite 0, ph 7.5). but there's a crazy looking fish in there I want. It didn't grow much since he's had it in the last year and is quite small (good intentions, poor husbandry skills) - is it possible he's stunted the fish? and I know that if it is indeed a Ropefish, I'll be able to upgrade to a larger tank shortly. and about half the diameter of a ballpoint pen. What differentiates it from all the Ropefish I've seen is, rather than no dorsal fin, it has a short, rectangular dorsal fin, about a half inch long by a quarter inch high, 2/3 down its length. The caudal fin flares outward with stiff spines supporting a similarly squared edge, like a shovel, instead of the diamond-shaped caudal fins I see on other Ropefish and bichir. It does however have four small mouth appendages and I have seen it burrowing in the substrate between making occasional darts to the surface of the water. 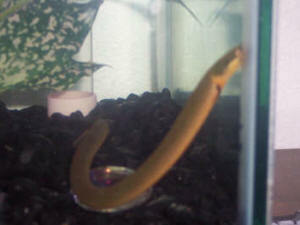 It definitely doesn't resemble a caecilian, dragon goby, fire eel, or a bichir. Forgive me if I'm mistaken, but I was under the impression that Erpetoichthys was the only species in its genus? Is there anything else that this wiggly, mellow little worm could be that I missed? what will happen to the dorsal fin as it matures? Should I expect this if/when I acquire more Ropefish? Sorry that I was unable to add a photo, thought I'd ask an expert anyway! <A photo would make for a more sure ID, but your description is very good. Ah! A Kuhli? Thanks so much!